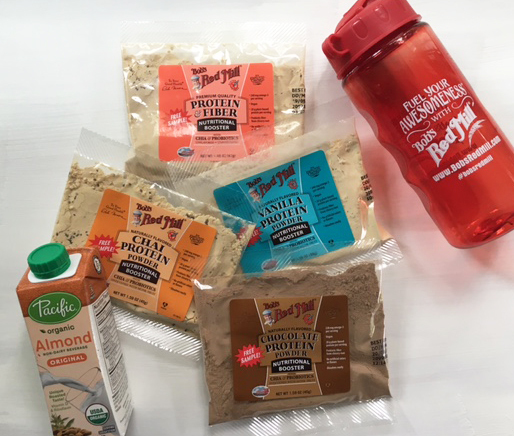 I’m more than a little excited to be part of Bob’s Red Mill ambassador program which means every now and then a care package arrives with something fun inside. Last time the box contained muesli and I made a rendition of my mom’s jam bars. This time it’s all about their new Nutritional Boosters that come in four flavors: vanilla, chai, protein & fiber and chocolate. Also included was an 8 oz carton of Pacific Almond Milk and a blending bottle that is going to make it easy to take these powders on the road. But you know me… I’m not just going to throw these in a shaker and write a blog about it. Oh no…. I’m going to find another way to use the Nutritional Boosters and this box gave me everything I needed to get started on a Chocolate Protein Powder Pudding! This recipe is completely adaptable to your tastes. 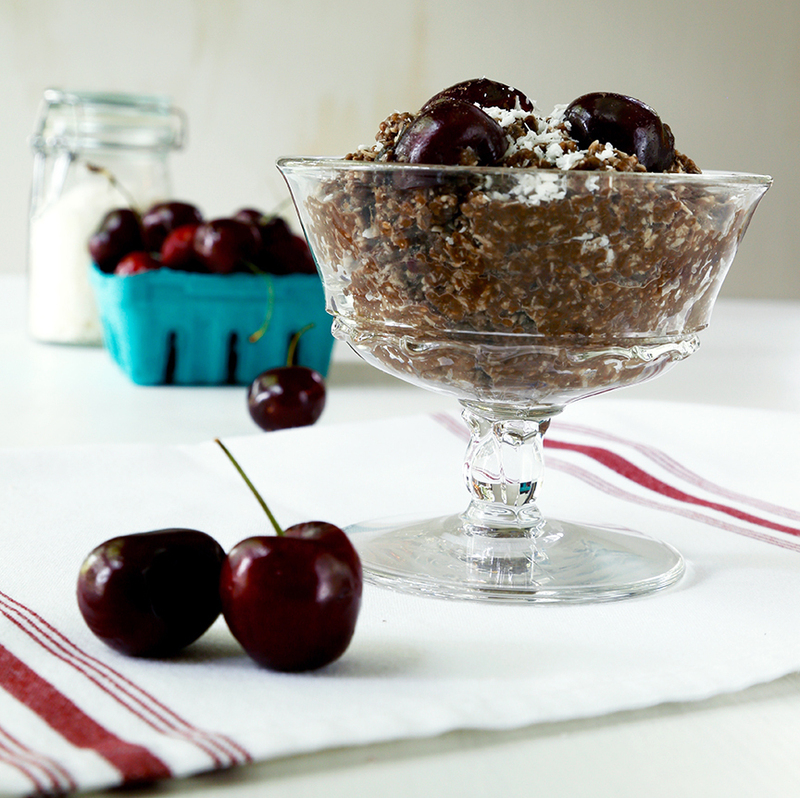 Cherries are one of my summer time favorites and they are in high season right now which means almost without a doubt that there’s some in the fridge, but blackberries or blueberries or countless other fruits could also be used. If you do use cherries check out my friend Lisa Lin’s clever trick for removing the pit without a cherry pitter. Don’t like coconut. No worries. Leave it out and top with toasted, sliced almonds or cacao nibs. Want it thinner, add more almond milk. Heck – give it a whirl with one of the other flavors of Nutritional Booster. This recipe is just that flexible. Sure, sometime when I’m rushing out the door, I’ll put a scoop of the Nutritional Booster in the blender bottle, top with almond milk and be good to go but this treat went together fast and really hit the sweet spot. Hope you enjoy it too! Mix Nutritional Booster, almond milk and chia seeds together. Let sit for 5 minutes for the chia seeds to thicken things up. 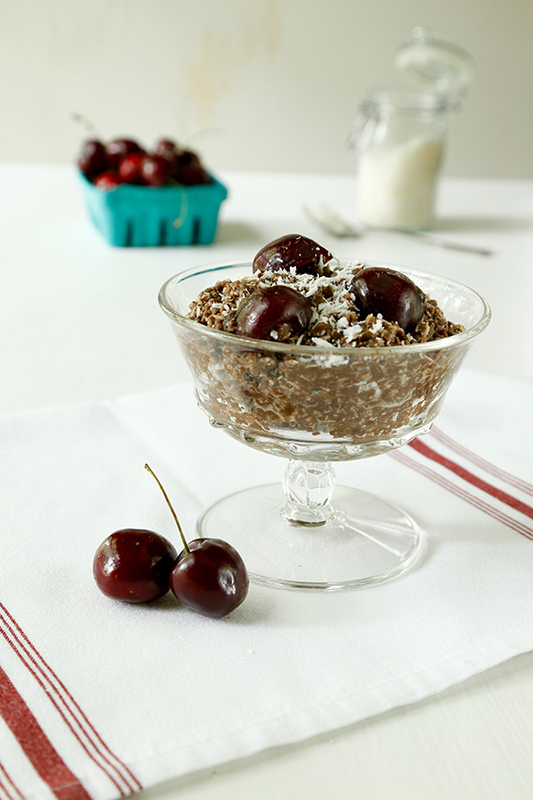 Stir in almond extract, coconut flakes and cherries. Thin with more almond milk if you like a thinner pudding. 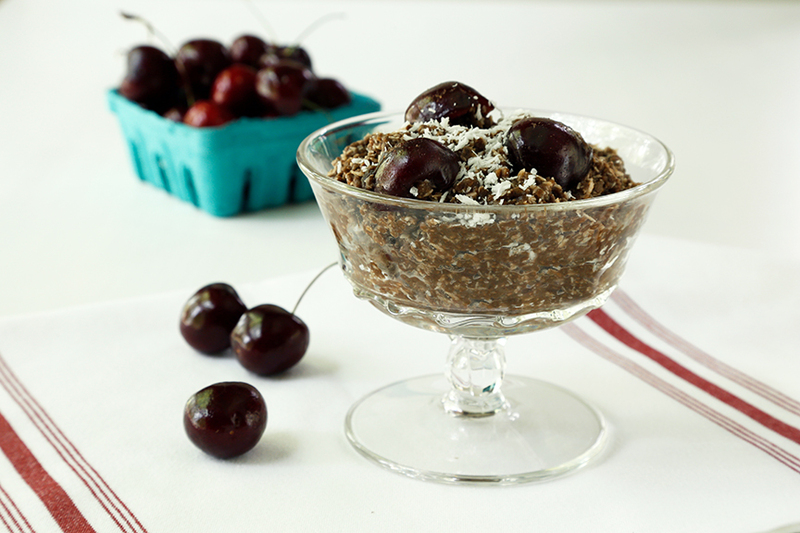 Garnish with a sprinkle of coconut flakes and gobble it up!